Part II: Can we retrain our brains too? Multitasking, a hip skill in the 1980s, has been derided recently, for instance by Theo Compernolle’s BrainChains (2015). We are told that we work much more efficiently if we focus on one task at a time. A related concept is ‘chunking’. This is the ability to hold a multiplicity of sets of abstract data in one’s memory and retrieve it as meaningful information. The average person is able to hold 7 pieces of information in their mind. This is probably because the brain itself is a multitasker. Neurons participate in more than one set of activity, so that the brain processes work in parallel to one another. In Bruce Hood’s words: ‘Our brains really do multitask using the same hardware.’ But this hardware is not limitless, and can get tired, as we saw in the first part of this blog. Can we train the brain to work on more than 7 pieces of information? Can we teach the brain to work faster? Can we make our brain adapt to more and more demanding situations? Dave Eggers’ The Circle (2014) has something to say about these questions. The novel chronicles the transformation of the twenty-something Mae Holland after she is employed by a Google-like internet company, the Circle. The Circle creates a closed system of communications in which everything is known, from the weather condition to the location of children. This is supposed to re-order the world democratically, though it also sees the demise of privacy and individualism. Holland learns to chunk when she is handling various sets of information on several computer screens. She pushes the limits of her brain, which brain adapts, bringing her performance to superhuman levels. Eggers’ dystopia presents this as harmful development. As working on more than one stream of information is extremely demanding on the mind, this inhibits Holland’s long-term memory. Soon she forgets her family, friends and the world beyond the Circle. Holland transforms from a modest young woman who cares about her struggling family into a cold, overambitious corporate monster who rejects love and family. She becomes hyper-rational, but sacrifices her humanity. The screen adaptation of Alan Glynn’s novel The Dark Fields (2011), the film Limitless (Dir. 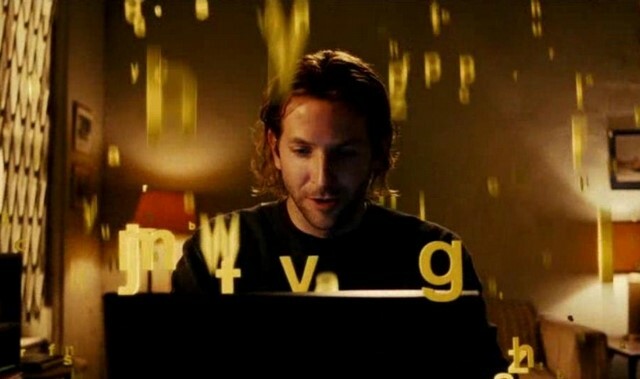 Neil Burgess, 2011), shows the writer Eddie Morra (Bradley Cooper) take a smart drug that allows him to maximize his brain’s capacity. Morra is able to analyse and predict the stock markets at a superhuman rate and recall seemingly forgotten memories from his distant past. The drug is highly addictive, though, and the withdrawal symptoms cause him to lose his power, age rapidly and potentially die. The brain becomes exhausted by its extensive use. Morra also loses his humanity. Are Eggers’ and Glynn’s verdicts too negative, to old school humanist? To what extent it is possible to retrain the human brain, and to make it adapt to new goals and purposes, whilst keeping our humanity and safeguard well-being. In the real world this is already a problem, with students taking smart drugs to perform better. I’m more optimistic about the brain’s ability to adapt to new situations. The way people have dealt with the digital revolution is actually quite astonishing. Neuroplasticity, which means that the brain throughout its life can adapt to specific circumstances, is not limitless, but it can take us a long way. Two things need to happen. First, pedagogy needs to change. We have inherited our schooling systems from 19th-century contexts, and is still much too rigid. Pupils sit statically behind desks which are rationally distributed throughout the class room. This set-up inhibits learning. We learn not just with our brains, but with our bodies: knowledge is an embodied activity. Another example: in our ‘technociety’, where we have instant access to knowledge, less emphasis should be placed on learning by rote. Content is much less important, the process of learning should be the focus. Another example: learning mostly operates via a focus on rational processes, through the communication of information, fact, data. But the brain is not simply a rational machine: it is dependent on biological processes that shape its functioning; it has unconscious drives; and it is emotional. Knowledge is shaped by emotions, and proceeds through failure and confusion. Learning should take into account these affective contexts. We are still imprisoned by the legacy of what Michael Foucault called the disciplinary society. Over the past 100 years, we have abandoned much of the disciplinary system based on hierarchical observation, ideas is what is ‘normal’, and constant examination. But we must push further to destroy this penal system. We must liberate ourselves with playful, flexible structures that focus on process, not just on content. Secondly, our brain needs help. We must integrate more with the technology that surrounds us, to create a hybrid of man and machine. We must strive to be prosthetic gods. If machines can do particular bits of thinking or acting for us, this will save us biological energy, which we can use for doing what humans are really good at, namely, creating complex thought that involves an inimitable mix of rational, irrational, emotional, subjective and associative forms of thinking. These two strategies can help us adapt to new situations; they can help us evolve, or, at least, diminish the gap between the demands of modern life, and the brains we have at our disposal to fulfil them. We may not have limitless use of our brain, but we can certainly make our heads work better. This entry was posted in Projects, Reseacher Profiles, Uncategorized and tagged data addiction, dystopia, information overload, infostress. Bookmark the permalink.